This week has really flown by! Of course, I spent half of it getting a healthy dose of sunshine and extended family during my vacation at Fontainebleau State Park. It was gorgeous out there and I was happily surprised that they had wi-fi in the cabins, so I wasn’t completely cut off from the blog and my Twitter addiction. Hours of play knocked the kids out at night and mixed drinks did the same for the hubs, so I even got a little reading time in! But there is no place like home and I’m glad to be back with Tumblr you guys. 5. Tuesday is a huge, huge release day. It’s like the publishers decided to save up a ton of big books to drop on us all on the same day. 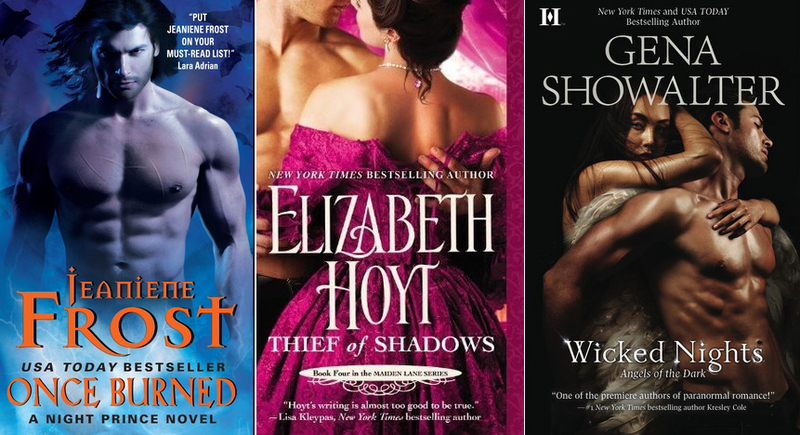 Some of the best coming out this week: Once Burned by Jeaniene Frost, Thief of Shadows by Elizabeth Hoyt, and Wicked Nights by Gena Showalter. 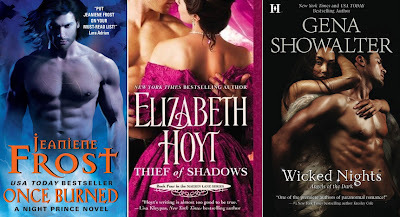 I also enjoyed Chasing Magic by Stacia Kane and Tempest’s Fury by Nicole Peeler. Oh! And Consumed by Rebecca Zanetti. But really, those are just the tip of the iceberg. What big June 26th release tickles your fancy? Tell me what you’re looking forward to *or* which books you wanna spread the word about. 4. A couple of tidbits from the awesome Jennifer Estep. The next book in her Elemental Assassin book, Widow’s Web is out in August, but if you can’t stand the wait, she’s got Chapter 1 up on her blog. In the meantime, she has revealed the cover for her next YA Mythos Academy book Crimson Frost. 3. The amazing Ilona Andrews is giving us a sneak peek of the next Edge book. You can find chapter 1 of Steel’s Edge up on her blog. This is the last contracted book in the series from what I understand and I must say I am sad. I really was hoping for a Jack and/or a George book. (**sniff**) I shall keep hope alive. Yes. I will go see it. 1. And speaking of guilty pleasures. Dallas is back. I was a huge fan of the original recipe Dallas, back in the 80’s. Of course, I was around 10 years old and I didn’t even realize how much of it I didn’t “get” until I watched the episodes again during a CMT re-airing while I was in college. So, have any of you seen the new version? Is it worth watching? Here’s the trailer if you’ve missed it. I need opinions before I commit. I saw this cover reveal on Harlequin’s Facebook page and Rrraw. Badly disfigured Lady Isobel Dalceann has fought fiercely to defend her keep, with little thought for her safety. Why, then, has she let a stranger within her walls? While he threatens danger, his battered body marked by war mirrors her own scars and tempts her to put her faith in him. Marc de Courtenay is a mercenary and a loner, although he is drawn to damaged—beautiful—Isobel. But in taking him into her highly defended, buttressed walls, she has unwittingly given him secrets that will enable him to betray her. What would she do if she were ever to find out who he really is…? I’m watching the new Dallas…and after episode one, I was so obsessed with Josh Henderson who plays John Ross Ewing!! YUM!!! Don;t really care what’s going on as long as I can stare at him!! LOL!! But really, I am enjoying the drama and sexiness, and little bit of comedy too. I so miss my soap opera!! The new Dallas is crappy, but those eyebrows are so f*cking distracting I’m tuning in just to see them. And I didn’t know there was a preview of the next Edge book (we need to pimp the heck out of that book so it sells and they write Jack and George’s book), off to read. Thank you Jen! Uh oh. One pro. One con on Dallas. I am with you on the Edge series. I LOVED the last book. And I want a George/Jack book so much I could taste it!! I’ve yet to read The Edge series. I need to check it out. Although I TRIED to sell my copies of the Twilight series to Hastings a few weeks ago (I say tried because they wouldn’t buy them since they had too many already) I’m still excited about BD 2. I have not read any Gena books. I really need to get on that. I loved Once Burned and Chasing Magic though. Really? She is one of my favorite PNR authors! This one is the first in a spinoff of her Lords of the Underworld series.